The small and peaceful Buddhist kingdom is nestled in the untouched beauty of Southeast Asia’s Himalayan mountains. Life is centered around its rich culture and traditions. While Bhutan has only allowed tourism since 1974, it's steadily developing. Along with centuries-old monasteries and temples, there are new luxury hotels and gourmet restaurants. With its stunning mountain backdrop and unspoiled nature, the country also has plenty of active adventure options. The best time to visit is fall, when the weather is optimal. Here’s what to see, eat, and do in Bhutan. Be one of the first guests at Six Senses Bhutan, a collection of five lodges throughout the country. Its property in the capitol, Thimphu, has sweeping views of the valley and a central location for daytrips. There’s a spa and wellness center, plus rooms with floor-to-ceiling windows. For a more intimate experience, check into Zhiwa Ling Ascent, the first Bhutanese-owned five-star hotel in the country. Located just outside of Thimphu’s city center, the 45-room property is decorated with hand-carved furniture, colorful paintings, and red-and-yellow silks. It also features a temple, where you can hear monks chanting throughout the day. Start with breakfast at the hotel. Both offer fresh, made-to-order local dishes, like momos (dumplings) or red rice. 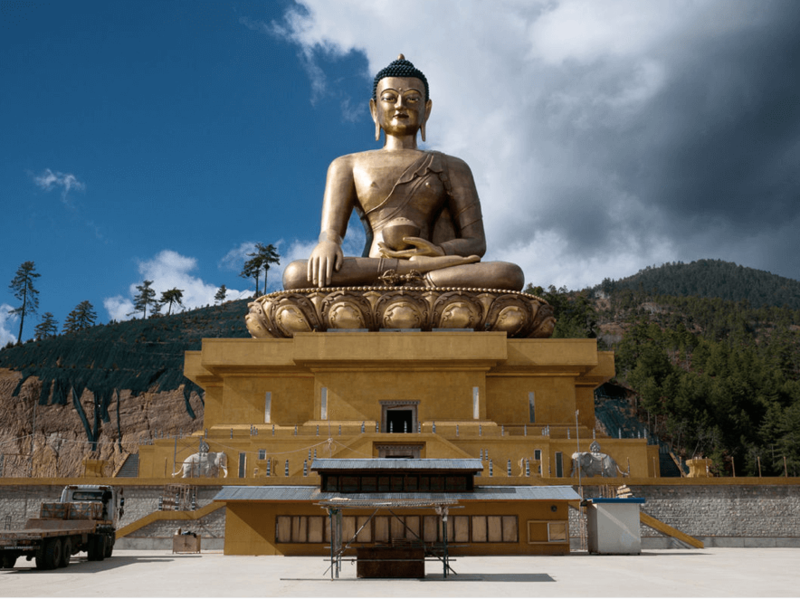 Start your day at Buddha Point to take in panoramic views and the majestic 170-foot Buddha Dordenma, made of bronze and gilded in gold. It sits atop a meditation hall and houses 125,000 smaller Buddha statues. 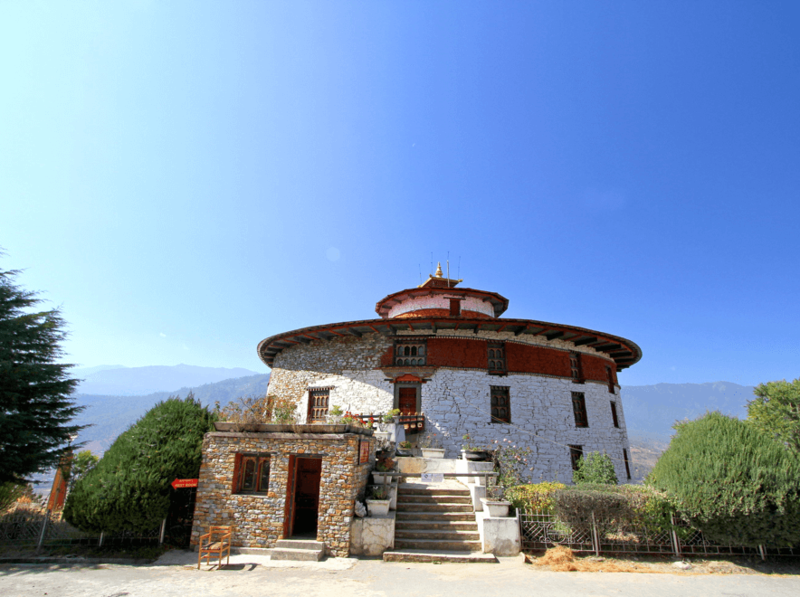 Then head to Zorig Chusum, the National Institute of Arts and Crafts, where you can find typical Bhutanese sculptures, paintings, and wood carvings. Or take a tour of Tashichho Dzong, a 17th-century monastery that stands at the seat of Bhutan’s civil government. End the day at Changangkha Lhakhang, a famous Buddhist temple on a ridge known for its prayer wheels. Thanks to the mountains and its perfect slopes and crags, Bhutan is paradise for climbers. Book with Vertical Bhutan Climbing Club, founded by Austrian expat rock climbing enthusiasts, and spend the afternoon climbing The Nose. This 100-foot-high rock face offers 13 routes for all levels. Don’t leave Thimpu without the 45-minute uphill hike to Cheri Goemba, the first monastery in Bhutan established in 1620. From here, go higher to the Demon-Subjugating Monastery built into the cliff for mesmerizing views. For a traditional Bhutanese meal, head to Babesa Village, a restaurant in a century-old building. Order the ribs and lom (dried turnip leaf). Start the day with coffee and an omelet at Ambient Cafe, a stomping ground for expats. Take a scenic 1.5-hour drive west to the town of Paro. 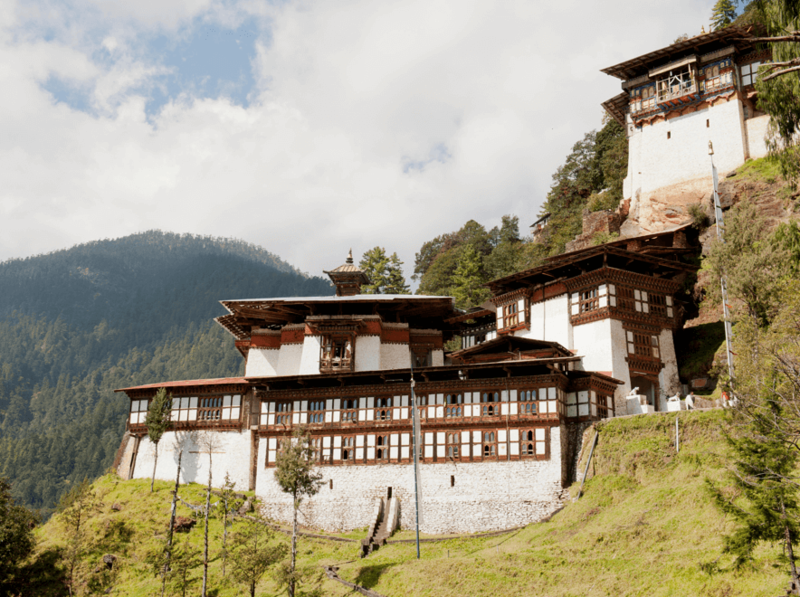 Check out National Museum, which has a large collection of Tibetan Buddhist paintings, and Kyichu Lhakhang, a 7th-century temple sanctuary said to have two magical orange trees. If you have the time and energy, take a three- to four-hour round-trip hike to Tiger’s Nest. The 17th-century monastery clings to cliffs 3,000 feet high. 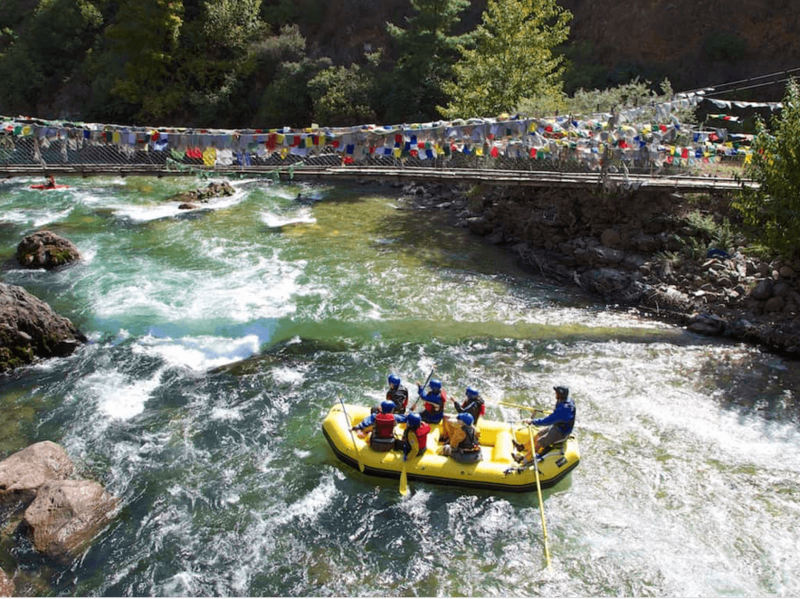 ith the breathtaking mountain backdrop, rafting down the Paro Chhu River is a thrilling way to explore Paro. It runs about five miles, and you generally go in groups arranged by your guide. Along the way, you’ll see an iron bridge built by a Tibetan monk in the 1400s. For those who are spellbound by Bhutan’s beauty, extend your stay for the famous six-day Druk Path Trek that starts in Paro. After the long day of exploring, head to Como Uma Paro, a luxury hotel. Its spa includes two private Bhutanese bathhouses and nine villas for therapies, such as hot stone massages. After you’re relaxed, have dinner at its restaurant, Bukhari. Choose from their Bhutanese dishes, such as a riverweed and egg drop soup, or Indian ones, including saffron rice and a vegetable curry. 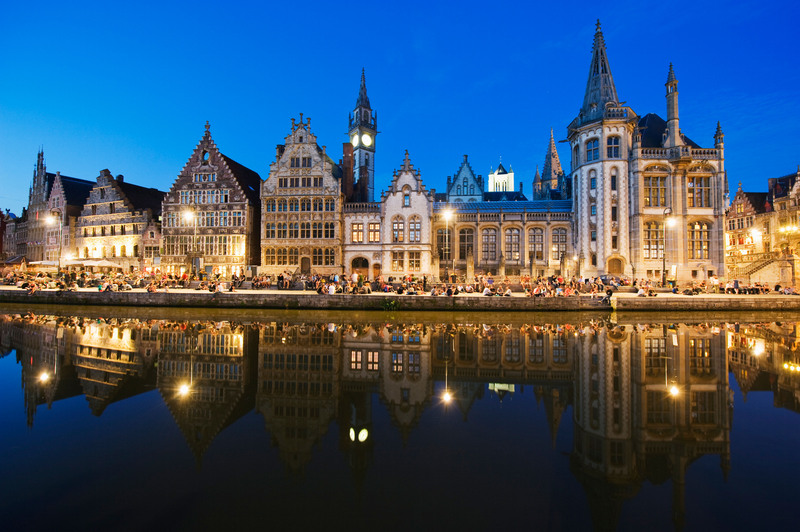 Visit this cosmopolitan city for innovative dining and plenty of adventure.